Russia’s Investigation Committee has established the name of another person suspected of organizing the Moscow Metro terror attack that took place on March 29, 2010, Itar-Tass news agency reports. ­Investigators believe 22-year-old Gusen Magomedov from the North Caucasian Republic of Dagestan accompanied two suicide female bombers to Moscow and also directed their actions on the day of the attack. The whereabouts of Magomedov are as yet unknown, and an official international hunt is underway. On the eve of the anniversary of the Moscow Metro blast, there were reports that two women – militants’ widows – left the Republic of Dagestan and were on their way to Moscow to commit another terror attack. However, on Tuesday this information proved false as Dagestani police discovered the women had not left the republic, Kommersant newspaper reports. On Tuesday, Moscow is commemorating the victims of the double terror attack that killed 40 and left more than 90 injured, exactly a year ago. 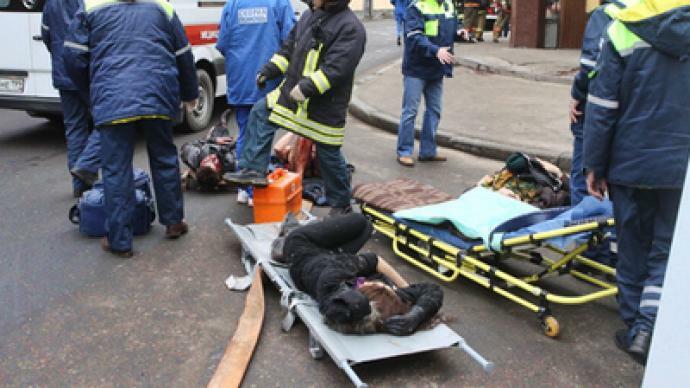 On March 29, 2010 two female suicide bombers detonated their devices at Park Kultury and Lubyanka Metro stations during the morning rush hour. One year later, the Investigative Committee has established the names of all seven organizers of these attacks. Six of them were killed in anti-terror operations and Magomedov is on the international wanted list. The beginning of 2011 was marked by another terror attack in the Russian capital. Thirty-seven people were killed when a suicide bomber blew himself up next to the crowded international arrivals hall at Moscow's biggest airport on January 24. However, anti-terror officials claimed on Monday that two suspects, thought to be behind the Domodedovo Airport terror attack, were detained in Russia's southern republic of Ingushetia. The National Antiterrorist Committee also reported that 17 militants were “eliminated” there as Law enforcement officers destroyed the base that had been allegedly used by militants for training suicide bombers. Unconfirmed reports say Doku Umarov, the man believed to be behind a number of high-profile crimes, including the attempted assassination of Ingush President Yunus-Bek Evkurov in June 2009 may have been among those killed in the operation. Russia’s most wanted man, Doku Umarov, claimed responsibility for organizing both terror attacks and is also on the wanted list of the UN Security Council’s Sanctions Committee, along with the world’s most dangerous terrorists.